I have made 3 doll quilts. (Camera at home, me at work - so no photos today.) I used "left-overs" before finishing the primary quilts! Depending on your interpretation, the ten plagues are blood, frogs, vermin, wild beasts, cattle disease, boils, hail, locusts, darkness, and death of the firstborn. So on my table runners, you start with the red square that represents blood go to the left, return to the red boils, and go left again. Exodus 7 through 12. I am having serious issues with "redoing" the Up Town quilt. It goes against my "Done is better than perfect" attitude in a very strong way! But I will persevere - maybe tonight? In the mean time, I have been cutting for my Zipper quilt! I hope it "works." By virtue of using one line of fabric, you usually get a good amount of value differences... This line Marcus Brothers Metro Blue is mostly medium... I hope the over all effect is not a big blob! A. I am not trying to sew anything complicated. B. I am not "watching" TV, more listening and looking up everyonce in a while. C. I do the same thing with my hand work, although probably less TV, as I have to concentrate more on the hand work, than the machine work. Up Town is a quilt top! (I am about to "rippit" on 1 part...) I forgot to take a picture of the top, but I will before I "fix it." I finally found a copy of the Kaffe Fasset book that MayBritt used to make this quilt... & I Played with my fabrics working on finding light, medium, and dark trios... (I am so crappy at value... I need to figure out the B&W setting on my camera - I hear that helps!) The book was in the library - I hung out at the library during the lunch break for the court. I have two ideas for coloration... green & blue cubes with red triangles or scrappy cubes with black triangles - or one of each! Michael & I did more shopping for Passover... I hope all I have left to buy is meat and produce! 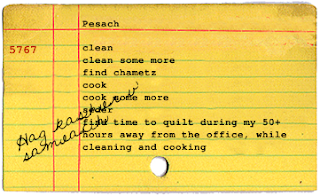 In the mean time, this will be the first passover that Michael and I are doing on our own... So the kind of stuff that familes have from years of holiday observances - are not owned by newly-weds... That coupled with the fact that Kosher foods are already more expensive than their non-kosher counterpart - we think $2.99/lb. is a deal for a frozen chicken... They are even more expensive for Passover... UGH! And where oh where will I be able to store this stuff for next year? I am in my office, supposed to be working (it is Saturday night)... But my Hancock's of Paducah order came in today, so all I can think about is SEWING! I should have gotten two of the charm packs for my Up Town project... 40 charms is hard to work with... But I will resist temptation and make it work! The only "pinwheel" in Confused Kitty - I tried to keep the browns on the edge for a "border effect" and I tried to put 4 purples together, so that they would show up more. I saw them demo. it on SQ, ran to the store and started it right away! (I was such a novice that I cut all of that cat fabric, not just the number of squares that I needed...) Only, they did not give you all of the dirt on the SQ show or HGTV website... I luckily found the pattern soon after & finished the quilt. I "happened" to find the backing material - perfect match IMHO in the sale bin! But what kind of cat did I get? I had to tie the ribbon to her tail for her to "play." As soon as she removed it, I got a dirty look and she went back to ignoreing it. However, if I hold the ribbon with in her reach, she will bat at it - but she will not expend any effort what so ever! The "whole" Funky Fish quilt. A school of striped bass. My only wish in hind sight is that I used a pieced scrappy background ala Clowns on Parade, by: Cathy Wiggins. Another source was the twin quilt that my GF made - she gave hers away as a graduation gift. And a quilt that I gave to charity. Yes, Ladies and Gentlemen today is the Vernal Equinox (in the Northern Hemisphere) I am actually about 1 hour late (it happened at 8:14 a.m.), but my computer was getting looked at by the IT guy... Because I am kind of geeky, I could go on, but the is a quilt blog with a smattering of travel and cats, not a science blog - I am not that knowledgeable! In honor of spring, here is a quilt that I rescued form a yard sale back in the very early 2000's. She was/is hand pieced & hand quilted, but someone washed her in a washing machine and dried her in a dryer (I do it all the time, but my stuff is machine pieced and machine quilted) so some of her seams popped. Since she was damaged goods, someone decided to sell her. So I rescued her... I even mended some of her popped seams (Before I knew what I was doing - so I did a whip stitch instead of a blind hem stitch, but they are mended nonetheless...) but I found another big seam that needs a repair when I pulled her out for photography. A bit close so you can see the fabrics. I ended up going home to get the rotary stuff & I made fairly good progress on my cats... THose of you who know the Buggy Barn technique, know that you are in essence slicing and shuffling and sewing and trimming, etc. right? 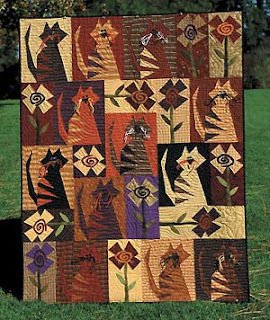 Well for the pattern that I am doing, you use 3 fabrics for each cat & there are 12 cats that I am doing... For the first three, I have bodies and tails done, now to do the ears and faces :o) The version shown here is the actual Buggy Barn quilt from the book, That Crazy Thing We Do. Mine will be similar, only instead of the plaids, I have geometrics - like polka dots. My first Trip Around the World. My second of 3 (so far) Trip Around the World quilts. (Yes, it is hung crooked, no it doesn't bother me.) I did this one and my first one the old fashioned way - with stacks of squares. My third one used the strip piecing method. And she made sure that he did not get anything that she might have wanted - like this knee tent - he loves then, she hates them! The lady then asked, "What is your name?" I replied, "Amy P. S."
She then stated, "Spell your last name." I replied, "If you are looking at my DL it is P..." (I need a roundtuit to get to the DMV - I also need to get a few car repairs done & the other license is good for a few more years...) "If you are looking at my work ID, it is S..."
She replied, "yes, we have your wallet." We are going to go to Mt. Vernon (I think.) I know, "That's not in Washington, DC." So why am I haveing such a hard time deleting the Up Town fabrics? I can justify the heck out of more cat prints... Someone who already has about 700 cat prints, really truely does need more! Meow! Well, color me silly - I just remembered that I am dealing with Moda - the people who brought me the charm squares that I love so much... I can get a set of charms for a lot less that my more limited selection of 1/2 yards... (I had a little bit of trepidation about mixing 1/2 yards with fat quarters - will they be balanced? - But I was ready to dive in head first yesterday regarding that tiny tid bit) So I have put the Kibosh on most of the Uptown fabric. The current plan is to get the charm pack, sew them together as a bunch of squares & use my fat quarters for the backing... Oh and at 1/2 price, I am so getting those kitty prints! So I "need" some more to make the quilt at least lap sized, right? A small sampling of what is going on in Bowie, Maryland. Triple 4 patch, very effective pattern, shown here in CW reproductions, but I have see it done in brights and batiks - equally effectively. Close up of the hand quilting... AMAZING! Instead of having a sign in book, we had our guests sign a quilt block. Here is the resulting quilt... (The binding is attached, but not hand sewn to the back...) Quilted by Sunshine Quilts. She also did a quilt that was used in my wedding, I wanted this quilt to have a similar feel. Jacob's Ladder - Nice and bright & scrappy! If I had to fit into one box, this is the one where I would be most comfortable. This quilt is the biggest size that Judy can fit onto her long arm! The backing - flannel, mostly Patrick Lose prints, but there is a 3rd cats on black that is not Patrick Lose..., The binding is a bright polkadot on black.